Beautiful scene Robert. The rolling stone fence adds much to the depth & dimension. Wow! What a wonderful photo! Beautiful autumn color! I can't believe this image was made in California. Looks like East Cost...Absolutely excellent!!! To my Favorites. 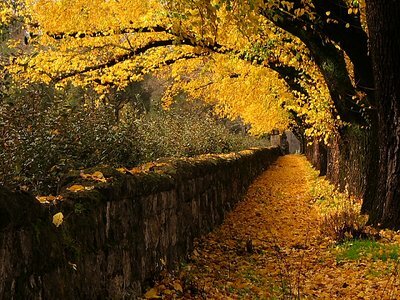 A truly gorgeous fall shot, Robert! Such an inviting path formed by the wonderful old trees and the stately stone wall - this whole image gives me a sense of strength and foundation, a rare permanance amid the slapdash nature of society... Really excellent! Well Robert you are better and better. I agree with you, this is your best photo AND personaly I think one of the 5 best photos on this subejct I ever seen before! But if you try sometimes, you just might find you get what you need. Excellent strong diagonal! Beautiful composition! Beautiful, the way the wall on one side and the trees on the other lead right into this picture. Great work. Don. Excellent colors and perspective; great composition and lighting. Lovely colours, fantastic lighting, good patience to wait for the fall :) Splendid! You had an A20 once? PowerShots are nifty little things aren't they? The the CCD takes it's sweet time, but it does really good Landscapes. Not much for me to say...that has not be said already... "Keep them comming, Bob!". Thanks Robert! !This one,marvellous colors and nice perpective! !Great works everytime! WOnderful perspective and nice warm colors... really well seen Robert! Superb image with wonderful fall colors. Great perspective. I don't even know what to say, I thought I had seen enough fall scenes to last me to next fall! But the image you have captured here is just superb! Wow, I really like this shot, Robert. EXCELLENT, what else can i add to describe the beauty and perfection of this shot? Robert, love this image. Beautiful colors and composition. It's surprise I see the yellow leaves overthere in the fall. Fantastic! Wow Robert! Very nice colors, lighting and I love this perspective. Yes we stiil have a lot of leaves also. My goodness!! This is absolutly stunning. Just magical. What an image!!!! Well you got that falling leaf-very nice touch-what else did you want anyway?Very fine autumn shot,excellent composition. The only thing I don't like is the long title... Astounding shot. Beautiful moment and very nice perspective. EExcellent in all aspects, bravo.